New York Times, USA Today, Wall Street Journal, and international best-selling phenomenon David Weber delivers the next book in the multiple New York Times best-selling Honor Harrington series. Yet she also knows scores of other star systems—some independent, some controlled by puppet regimes, and some simply conquered outright by the Solarian Office of Frontier Security—lie in the League's grip along its frontier with the Talbott Quadrant. As combat spreads from the initial confrontation, the entire frontier has begun to seethe with unrest, and Michelle sympathizes with the oppressed populations wanting only to be free of their hated masters. That puts her in something of a quandary when a messenger from Mobius arrives, because someone's obviously gotten a wrong number. According to him, the Mobians’ uprising has been carefully planned to coordinate with a powerful outside ally: the Star Empire of Manticore. Only Manticore—and Mike Henke—have never even heard of the Mobius Liberation Front. It's a set-up... and Michelle knows who's behind it. The shadowy Mesan Alignment has launched a bold move to destroy Manticore's reputation as the champion of freedom. And when the RMN doesn't arrive, when the MLF is brutally and bloodily crushed, no independent star system will ever trust Manticore again. Mike Henke knows she has no orders from her government to assist any rebellions or liberation movements, that she has only so many ships, which can be in only so many places at a time... and that she can't possibly justify diverting any of her limited, outnumbered strength to missions of liberation the Star Empire never signed on for. She knows that... and she doesn't care. 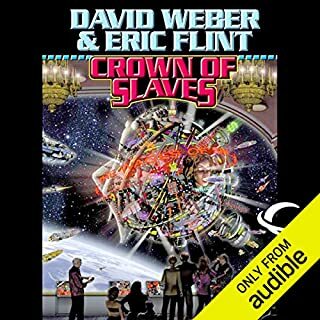 ©2013 Words of Weber, Inc. (P)2013 Audible, Inc. I think there is an error in the listing of this book. It is marked Honor Harrington Book 14 which is wrong. There is nothing about Honor and the book does not pick up where book 13 ended. I am still waiting with anticipation to find out what happened to Manticore , Grayson and Torch after the attack by Mesa Alignment group and then the Solarian Navy. Bits and pieces are hinted at in this and other secondary series books. When will we learn about what's going on? 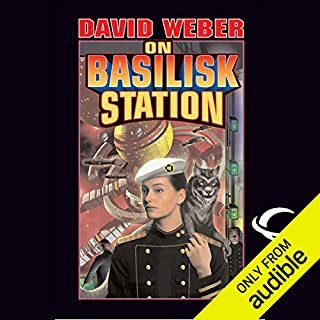 This book is correctly marked as book three in the Saganami series which is mainly about Admiral Michelle Henke (Lady Goldpeak) and her command in the Talbot Quadrant. Next to Honor I like Mike the best. She is Honor best friend since Academy days. This book Mike discovers the Mobius Liberation Front is in a full scale uprising against the corrupt government of the their world along with the Solarian Office of Frontier Security. Mike learns that the Liberation Front thinks that Manticore has provided them with arms and is to help them. She thinks this is a Mesan Alignment trick to discredit her Star Kingdom. Mike sent ships to help Mobius then another similar problem occurs on another plant. Lots of politics and building up new characters, some suspense but in the second part I thought for sure we would have a big battle ( Weber is great with his battle scenes) but no only a small action. Missed the naval battles in this book. Feel it was a book that is providing background for what is to come next. 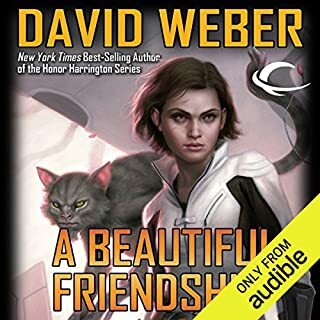 I love David Weber and the Honor Harrington franchise. It seemed to me these books Storm from the Shadows, A Rising Thunder, Shadow of Freedom could have been combined into one. In several cases complete conversations were duplicated from other books. I realize it was during the same time line and there was necessary over lap. Still one or even two longer books would have been better than three with so much duplication. I started to find it hard to pay attention at times as things were rehashed. Of course I did them almost one after another, had I read them as they were released my opinion might be different. Would you consider the audio edition of Shadow of Freedom to be better than the print version? I have them together. I love the audio.. Always my fav.. Put it with e-book and I have the best of both worlds. The book helps lock in the names for my little brain. What was one of the most memorable moments of Shadow of Freedom? The end. She puts all the bad guys in a line and gets it right. Than she goes for it. Great Series. What about Allyson Johnson’s performance did you like? She catcher the humor and each personality. God bless, Beth. I love you. 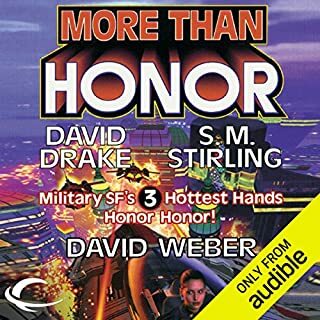 I have enjoyed " The Honor Harrington " series very much. I also love the " Shadow Of Saganami Companion "series and " The Torch of Freedom". All part of the one. I just wish David Weber could write faster. I hop I live long enough for the end. I find I am ready for it. Please, Someone, Tell Me It Will be Over Soon? About a year ago, I wrote a very positive review of A Rising Thunder. 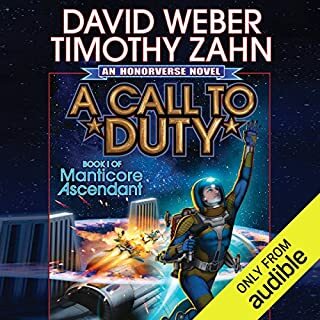 Remembering that feeling of surprised enjoyment prompted me to disregard the more negative reviews and my own reservations and proceed cautiously into this latest Honorverse entry. And despite understanding and agreeing to some degree with many of the complaints with this release, I am fairly satisfied. As has been noted before, this is the second half of A Rising Thunder, broken off because that book had just become monstrously long. The break is not chronological though, but instead focuses on what some of our (or somebody's) favorite characters were doing during the same time period, much like George R.R. Martin's A Feast for Crows and A Dance with Dragons, if that reference helps anyone. Like I said, it means we get more time with characters left out of the previous story. Unfortunately, you may end up feeling as I did about halfway through, that you're being treated to a whole bunch of B plots. I don't know if they were all their originally, or if they were added to fill in the story when it was spun off, but there are several elements like the one cited by another reviewer about the kids whose dad is in prison and start a resistance movement that just kind of....is there. Another similar set of characters is introduced and never heard of again. I guess it's meant to introduce tension, but just comes off as sloppy or downright lazy. There are also many discussions of dispatches from around the galaxy to inform you of things going on during A Rising Thunder that might confuse you if you haven't read that book recently or recall its events too clearly; I had to consult a summary at one point when the characters had gone on for a few minutes and I just got tired of guessing exactly what they were talking about. While I'm at it, the Alignment POVs have to be the most annoying thing to have come along in these last few Harrington novels. They were so much more interesting when they were an unknown quantity, they now just seem completely ridiculous, trotted out to bemoan their thwarting by our heroes, only for one of them to remind the others of some codename project we've never heard of that makes them rub their hands in anticipation. So why rate it as highly as I do? There are a few interesting character moments, particularly for some of the junior RMN officers. Personally, I've always had a soft spot for a certain GSN lieutenant who gets in a few good scenes. Also, there are some good battle scenes on the ground and in space. I always worry that hearing about SLN ships getting blown up will get old, but it hasn't yet... And not that it matters, but Weber throws in some OFS people that aren't total jerks, which given the number who are that and worse, is sort of refreshing. I can understand the complaints about the narration too, but given the book's origins it would have been Johnson reading these segments originally anyway had the author had his way. The same understanding goes for issues with how little the book advances the overall plot, given that we're essentially dealing with a companion novel rather than a sequel or even a standalone spinoff thanks to publishing concerns. That's a heck of a thing for me to be saying, since I suspect we should all be wishing for the editor to be winning more battles with Weber, not fewer. I seem to recall whole campaigns from the first war with Haven that were far more significant to the overall plot than almost everything in this book that were only touched on in briefings or other such conversations. So the bottom line I think is that given the way Weber recaps so much of what's happened in previous novels, you might actually be able to skip this one. If you like the characters currently serving in this part of the galaxy, there should be enough for you here. Otherwise, I'm sure the next proper sequel will have three or four chapters in which the universe's main characters discuss the significance of the events contained here, presumably with at least one disastrous assumption over what it all means for the strategic picture on the part of the League, the Star Empire, Mesa, some star nation we've never heard of, or all of the above...and maybe that'll contain more of what people turned to Shadow of Freedom for and found lacking. 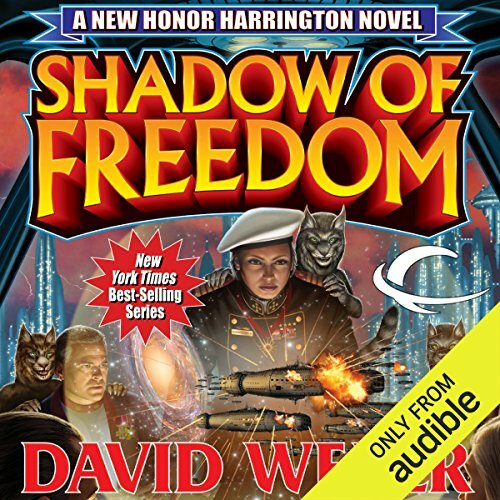 I’m coming to the conclusion that to recommend David Weber’s Honor Harrington series is illegal for the reason that it breaks the Constitution’s prohibition against cruel and unusual punishment. When I was about halfway through this book, I seriously debated whether to finish listening to it. I was so incredibly frustrated I had to restrain myself from throwing my iPod against the wall. For my taste, Weber has always spent far too much time with the bad guys onstage plotting their evil deeds. But in the early books, it seemed like there were just a few locations and groups of bad guys. So maybe you got a half-hour of the good guys doing their good guy stuff, and then you got ten minutes of bad guy stuff. But in this book it seemed like there were a couple of dozen groups of bad guys all in different locations. So you got maybe ten minutes of the good guys, then 15 minutes with bad guy #1, 15 minutes with bad guy #2, .... until you finally got to bad guy #37, and then you finally got 10 more minutes with the good guys. Also, there are WAAAY too many characters and locations to keep track of them with ease. I imagine there were maps if you bought the hardcover, but us second-class citizens who listen to our books don’t get maps. There is an Honorverse wiki site on the internet that has clickable character bios that you can use to figure out who is who and where they fit into the story. But should it really be necessary for readers to have footnotes in order to follow what’s going on? And then it ended on a cliffhanger. I actually shed a couple of tears when this book came to an end. Not because I was sad that it had ended; not in sentimental happiness at the wonder I had just finished reading. It was combined rage and frustration, because Weber has sucked me in again. I need to know what is going to happen in the next book. I hope that with a year to cool myself off, I will be able to resist buying the next book. This series has stopped being fun. It’s more like drug addiction. I’ve got to have my fix, but there is no pleasure in it anymore, just the degrading feeling of being out of control. If you love Honor Harrington and adore her treecat, Nimitz, you are going to be disappointed as neither makes an appearance in this novel; perhaps because it's the second half of "A Mighty Thunder," divided in half no doubt because of its extreme length. Well, "Shadow of Freedom" is still too long. Mr. Weber, always fond of using too many words, has padded this story out beyond easy comprehension. He introduces multiple new situations and multiple new characters to the point where the listener becomes confused and bored. About 25% of the novel is good, with great battle scenes, though they are a bit long. The rest is eminently forgettable. The author normally excels at keeping his plot lines and timeline consistent, but this time, he seems to have erred in a short Zilwicki sequence and a reference to Honor Harrington's role in constructing the peace agreement with Haven. The latter seems perfunctory and not consistent with the time frame of the rest of the story. I, along with other reviewers, would like to see the Mesan Alignment tale brought to a conclusion. Instead, 17 hours later, the plot has advanced only a little. Mr. Weber owes his readers, and listeners, a tighter, better-constructed story, with some kind of end in sight, rather than the ponderous unwieldy tale he just published. If the series continues in this bloated way, I am going to be rooting for Manpower to win! As always, Weber plots a great story with well-developed characters. I re-read and re-listen to the entire series, including the spin-offs, before each new book's publication. Allyson Johnson's voices are perfect for this series, too. I highly recommend Weber's "Safehold" series as well. Keep 'em coming, David Weber! Tremendous! All I want is more Honorverse! More Mike Henke, more Cachat, more Zilwiki, more Honor,Nimitz, etc. Meanwhile, looking at other Honorverse books. Less 'bad-guy' ruminations, more actions, and tying up loose threads. Maybe I drifted off where he let us know what happened to the two kids whose dad is in jail? I can't bear to go listen to the last half of the book again to find out if I fell asleep thru some of it. Also, I wonder if his contract says he is getting paid by the word? This book at best would have been a novella for the usual writer. He needs to go re-read Basilisk station and some of his earlier books to remind himself of how he used to write. I was one of the ones who waited impatiently for his books to come out and always purchased them in hard back. I was one of the fans who helped make him so popular. Now he seems to feel as though he can sit back and rest on his laurels and we, mindless sheep that we are, will continue to buy his repackaged placeholders. He probably should have just stopped this series when Honor made Admiral. He has lessened her involvement and gotten much more fascinated with all the politics he has conjured up. So, he extends the story arc further and further, but not in a good way. Honor is a ghost of herself even in the books that supposedly center on her. In our day and age, Honor would have been elderly or dead by now and the story could have been picked up with one of the young ones - adding youthful enthusiasm, mistakes and derring-do back in the mix. But with pro-long, Honor keeps on keeping on and what else can he say about her? He had to find something else to write about to keep his sheep buying the books so he turned to politics. But, David, politics should just be a short part of the back story - not the main story. We buy them because we love the humanity, compassion, decisiveness, and actions involved in the conflicts and space battles. It is good to know why they are fighting, but we want less rambling on about the thoughts that this bad guy or that bureaucrat has and more of the actions that make a book exciting. I always like Honor and Mike. If you could play editor, what scene or scenes would you have cut from Shadow of Freedom? Most of the bad guy scenes, every other word whenever we are in the mind of a bureaucrat or bad guy. a story that went somewhere. Keep side stories smaller. This whole book was a side story of a side story. The few chapters of new material in the book were entertaining and followed Webers usual format with arrogant cognitively challenged enemies insisting on throwing themselves into the Manticoran meat grinder. Unfortunately the majority of the book was taken up by recapping the events of the last few novels in the series. Overall the feel was that of a tired sitcom that starts to reel out flashback episodes when the script writers run out of new ideas. 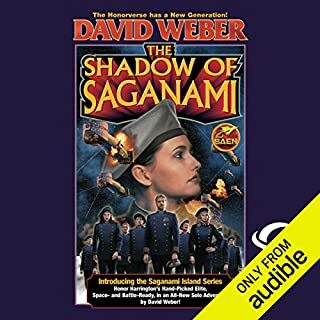 I sincerely hope that David Weber was just experimenting with the recap style rather than trying to string out the plot to a few more books.